LEO A. RODGERS and SUSAN V. RODGERS vs. JOHN S. O'BRIEN and JEAN T. O'BRIEN. Plaintiffs seek a declaratory judgment under the provisions of General Laws Chapter 231A, Section 1 that they are the record owners of a certain parcel of property located at 609 South Street, Dalton, Massachusetts; that they have been in exclusive continuous possession of said premises since acquiring it by deed in 1946; and that defendants have no claim to any portion of the said premises by adverse possession. In addition, plaintiffs seek to have the Court permanently enjoin defendants from interfering in any way with plaintiffs' rights to exclusive possession of the property. Plaintiffs further ask the Court to award them costs and counsel fees. A hearing on the matter was held October 19, 1979 and January 3, 1980 at which a stenographer was sworn to take and transcribe the testimony. Five witnesses testified and twenty-two exhibits were entered into evidence and are incorporated herein for the purpose of any appeal. 2. Defendants O'Brien own the lot of land on the westerly side of South Street abutting the plaintiffs' parcel to its northeast as shown on a "Plan Showing Land of John & Jean O'Brien on South Street, Dalton", Scale 1" = 40', R.D. Jordan, July 1977. (Exhibit 3) Defendant Jean O'Brien and her first husband, Merwin P. Magnin, acquired this property as tenants by the entirety by a deed dated September 29, 1947, recorded in Book 531, Page 471 from Henry L. Miclette and Rose M. Miclette. After Mr. Magnin's death and her marriage to John S. O'Brien, Jean O'Brien conveyed the property to herself and John S. O'Brien as tenants by the entirety by a deed dated August 21, 1971, recorded in Book 912, Page 108. 3. The area in contention is the narrow strip of land lying on the plaintiffs' side of the boundary line, containing seven hundred seventy square feet as shown on Appendix A. 4. Within the strip is a row of Balsam trees planted by the plaintiffs in about 1952. 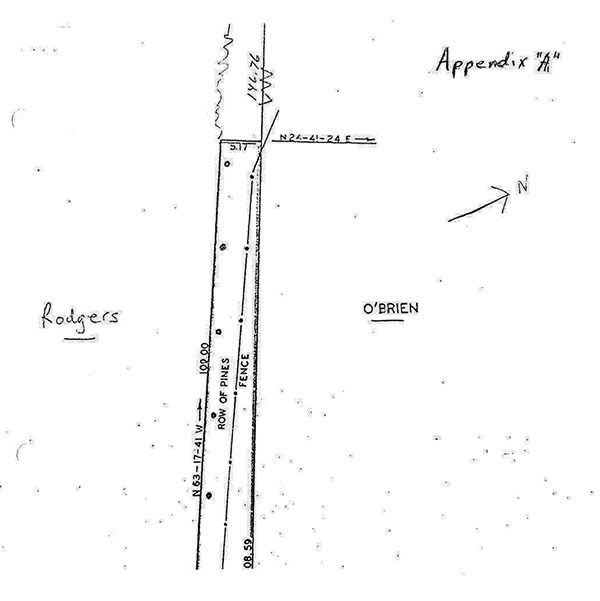 These are shown as "Row of Pines" on Appendix A and begin at the rear of the area claimed by defendants about five feet southerly of land admitted to belong to plaintiffs by the defendants in their amended answer and running in a line more or less perpendicular to South Street over approximately the westerly half of the area claimed. A barberry bush hedge, planted and cared for by plaintiffs, continued in the line of the balsams easterly stopping a few feet short of South Street. This was uprooted by defendants in 1975. Plaintiffs Rodgers maintained a picket fence just north of the balsams and barberry hedge but still southerly of their lot line as shown on Appendix A. Peonies given by Mrs. Rodgers to Merwin Magnin were planted by him between the picket fence and defendants' line with plaintiffs' permission. There was controversy over whether plaintiffs or defendants maintained the peonies and due to defendant Mrs. O'Brien's obvious unfamiliarity with peonies the Court finds these were maintained by the plaintiffs. There was also controversy over the maintenance of the lawn in the strip near South Street and the Court finds this was also maintained by the plaintiffs, being raked and mowed mostly by one of plaintiffs' daughters. 5. The home on defendants' lot was built in 1954. From this time until 1966 there was no problem between the parties. Mrs. Rodgers and Mr. Magnin worked on their respective parcels gardening and maintaining them, sharing plants and advice. Mrs. O'Brien testified that she mowed some of the lawn and grew oriental poppies on the disputed area until about 1968. She claimed to have also grown peonies there but, as previously mentioned, demonstrated a basic lack of knowledge of the flower. 6. In 1966, to make room for a fourteen foot addition to the southerly end of their house, defendants moved their gravel driveway southerly some fourteen feet and laid it out so that it was wholly on their side of the boundary line. To obtain a building permit to construct the addition defendants needed to apply for a variance because otherwise the addition would be placed too close to their southwesterly line, bounded as it was by the plaintiffs Rodgers. Mr. Magnin explained this to the Rodgers who did not oppose the granting of the variance. 7. In 1972 the defendants' driveway was covered with hardtop and its width was expanded southerly three feet along its entire length over the boundary line into the disputed strip, as shown on Appendix A. 8. In 1975 the defendants, without plaintiffs' permission or knowledge had a backhoe brought in and ripped out the barberry bushes. The barberry hedge was then replaced by defendants with hemlock. Plainiffs then arranged to have their property surveyed and sought advice of counsel. After conferring with more than one attorney, plaintiffs brought the present complaint. On all the facts the Court finds and rules that the defendants have not sustained their burden of proof. Rather, the evidence shows that the plaintiffs have cared for this parcel of their property and have sought to protect it to the best of their ability. The Court orders that judgment issue that the plaintiffs are the record owners of the parcel shown on Appendix A, unencumbered by any claim of defendants to adverse possession of said parcel; and that the defendants remove so much of the hardtopped driveway as encroaches upon plaintiffs' property, and that defendants are hereby permanently enjoined from interfering with plaintiffs' exclusive possession and enjoyment of their said property. Plaintiffs are awarded counsel fees allowable as statutory taxable costs, Mass. G. L. c. 261, §23. [Note 1] Appendix A is a copy of the pertinent portion of Exhibit 1, a "Plan of Disputed Boundry [sic] Area Between Rodgers and O'Brien on South Street, Dalton" Scale 1" = 10', R.D. Jordan, Oct., 1979. [Note 2] All references to books and pages are to documents on file at the Berkshire Middle District Registry of Deeds unless otherwise indicated.